Update now to the 2018 edition of NFPA 1, Fire Code based on the latest NFPA® codes and standards governing fire and life safety. Adopted in jurisdictions throughout North America, NFPA 1, Fire Code presents a comprehensive, integrated approach to fire code regulation and hazard management. Fully updated for 2018, this edition features extracts from and references to more than 130 NFPA codes and standards. Staying up-to-code gives fire marshals, code officials, inspectors, facility owners and managers -- and anyone who has responsibilities for life safety, building safety and hazardous materials -- the latest fire protection requirements for fire alarm, sprinkler, building and process hazards as well as life safety issues. Interested in other editions of NFPA 1, Fire Code? Use the drop down menu above to select the edition year you need. 1.4 Equivalencies, Alternatives, and Modifications. 1.8 Duties and Powers of the Incident Commander. 1.10 Fire Code Board of Appeals. 1.16 Notice of Violations and Penalties. 5.5 Evaluation of Proposed Designs. 10.6 Reporting of Fires and Other Emergencies. 10.7 Tampering with Fire Safety Equipment. 10.10 Open Flames, Candles, Open Fires, and Incinerators. 10.12 Seasonal and Vacant Buildings and Premises. 10.14 Special Outdoor Events, Carnivals, and Fairs. 10.18 Storage of Combustible Materials. 10.19 Indoor Children’s Playground Structures. 11.2 Heating, Ventilation, and Air-Conditioning. 11.3 Elevators, Escalators, and Conveyors. 11.6 Waste Chutes, Incinerators, and Laundry Chutes. 11.7 Stationary Generators and Standby Power Systems. 11.10 Two-Way Radio Communication Enhancement Systems. 11.11 Medical Gas and Vacuum Systems. 12.3 Fire-Resistive Materials and Construction. 12.4 Fire Doors and Other Opening Protectives. 13.7 Detection, Alarm, and Communications Systems. 13.8 Other Fire Protection Systems. 13.9 Non-Listed Fire Protection or Suppression Devices and Equipment. 14.4 Means of Egress Reliability. 14.6 Enclosure and Protection of Stairs. 14.8 Capacity of Means of Egress. 14.9 Number of Means of Egress. 14.10 Arrangement of Means of Egress. 14.12 Illumination of Means of Egress. 14.14 Marking of Means of Egress. 14.15 Secondary Means of Escape. 15.2 Level of Service Objectives. 15.4 Fire Department Service Delivery Concurrency Evaluation Documentation. 16.4 Safeguarding Construction and Alteration Operations. 16.5 Fire Safety During Demolition. 16.7 Tar Kettles and Rubberized Asphalt Melters. 18.4 Fire Flow Requirements for Buildings. 19.2 Combustible Waste and Refuse. 20.5 Residential Board and Care Occupancies. 20.6 Ambulatory Health Care Centers. 20.7 Detention and Correctional Occupancies. 20.10 Lodging or Rooming Houses. 20.11 One- and Two-Family Dwellings and Manufactured Housing. 20.16 Special Structures and High-Rise Buildings. 20.17 Historic Buildings and Cultural Resources. 21.3 Rooftop Heliport Construction and Protection. 22.3 Fire Department Access Roads. 22.9 Motor Vehicle Fluids and Hazardous Materials. 25.4 Folding and Telescopic Seating. 27.3 Recreational Vehicle Parks and Campgrounds. 28.1 Marinas, Boatyards, and Other Recreational Marine Facilities. 28.2 Marine Terminals, Piers, and Wharves. 28.3 Construction, Conversion, Repair, and Lay-Up of Vessels. 30.1 Motor Fuel Dispensing Facilities. 31.3 Protection of Storage of Forest Products. 32.4 Soundstages and Approved Production Facilities. 33.7 Outdoor Storage of Altered Tire Material. 34.6 Building Equipment, Maintenance, and Operations. 34.7 Protection of Rack Storage. 34.8 Protection of Rubber Tires. 34.9 Protection of Roll Paper. 34.10 Storage of Idle Pallets. 38.5 Growing or Production of Marijuana. 40.5 Operating Procedures and Practices. 40.6 Inspection, Testing, and Maintenance. 40.7 Training and Hazard Awareness. 40.9 Emergency Planning and Response. 41.2 Responsibility for Hot Work. 41.4 Sole Proprietors and Individual Operators. 41.5 Public Exhibitions and Demonstrations. 42.8 Additional Requirements for CNG, LNG, Hydrogen, and LPG. 43.2 Automated Electrostatic Spray Equipment. 43.3 Handheld Electrostatic Spray Equipment. 43.4 Drying, Curing, or Fusion Processes. 43.7 Organic Peroxides and Plural Component Coatings. 43.8 Styrene Cross-Linked Composites Manufacturing (Glass Fiber–Reinforced Plastics). 43.9 Dipping, Coating, and Printing Processes. 45.4 Vehicles and Material Handling Equipment. 45.5 Loose Storage of Combustible Fibers. 45.7 Storage of Hay, Straw, and Other Similar Agricultural Products. 50.3 Protection of Coverings and Enclosure Materials. 50.5 Procedures for the Use, Inspection, Testing, and Maintenance of Equipment. 50.6 Minimum Safety Requirements for Cooking Equipment. 50.7 Mobile and Temporary Cooking Operations. 52.2 Lead-Acid and Nickel-Cadmium Batteries. 53.3 Operations, Maintenance, Testing, and Decommissioning. 54.3 Piping, Valves, and Fittings. 60.3 Classification of Materials, Wastes, and Hazard of Contents. 60.4 Permissible Storage and Use Locations. 60.6 Emergency Action Planning, Fire Risk Control and Chemical Hazard Requirements for Industrial Processes. 61.3 Storage in Warehouses and Storage Areas. 63.7 Bulk Liquefied Hydrogen Systems. 63.9 Insulated Liquid Carbon Dioxide Systems. 63.10 Storage, Handling, and Use of Ethylene Oxide for Sterilization and Fumigation. 63.11 Liquid Oxygen in Home Care. 65.3 Pyrotechnics Before a Proximate Audience. 65.4 Flame Effects Before an Audience. 66.4 Definition and Classification of Liquids. 66.6 Fire and Explosion Prevention and Risk Control. 66.8 Application of Area Classification. 66.9 Storage of Liquids in Containers — General Requirements. 66.14 Hazardous Materials Storage Lockers. 66.16 Automatic Fire Protection for Inside Liquid Storage Areas. 66.18 Dispensing, Handling, Transfer, and Use of Liquids. 66.21 Storage of Liquids in Tanks — Requirements for All Storage Tanks. 66.22 Storage of Liquids in Tanks — Aboveground Storage Tanks. 66.23 Storage of Liquids in Tanks — Underground Tanks. 66.28 Bulk Loading and Unloading Facilities for Tank Cars and Tank Vehicles. 69.2 LP-Gas Equipment and Appliances. 69.3 Installation of LP-Gas Systems. 69.5 Storage of Cylinders Awaiting Use, Resale, or Exchange. 69.6 Vehicular Transportation of LP-Gas. 69.7 LP-Gases at Utility Plants. 69.8 Liquefied Natural Gas (LNG) Facilities. NFPA 1: Fire Code is your complete safety source for fire alarm, sprinkler, and life safety issues. NFPA 1: Fire Code presents an integrated approach to fire code regulation and hazard management that gives fire marshals, architects, engineers, building owners -- and anyone involved with hazardous materials -- a comprehensive source of essential safety knowledge. Adopted in jurisdictions throughout North America, the Code addresses all aspects of fire protection, fire safety, and life safety through extracts from more than 50 NFPA® codes and standards, along with references to many more. Each edition reflects updates in industry benchmarks such as NFPA 13: Installation of Sprinkler Systems, NFPA 25: Inspection, Testing, and Maintenance of Water-Based Fire Protection Systems, NFPA 54: National Fuel Gas Code, NFPA 72®: National Fire Alarm and Signaling Code, and NFPA 101®: Life Safety Code®. The 2015 NFPA 1: Fire Code contains major changes, including: Chapter 18 includes mandatory requirements on fire hydrant location and distribution -- to assist designers with planning and AHJs and other authorities with inspections; Added mandates for carbon monoxide detection and alarm for new educational and new day care facilities and other changes reflect safeguards in the 2015 NFPA 101®: Life Safety Code®; as well as coverage of fire alarm systems for occupancies now mirrors NFPA 101 to provide additional information and reduce reference time. Watch an interview with NFPA's Greg Harrington, Principal Engineer, Building Fire Protection, discuss the 2015 NFPA 1, including changes from previous editions. The 2012 edition of NFPA 1: Fire Code improves your ability to ensure occupant safety with added mandates for sprinklers in all new buildings three or more stories in height and CO detection in new residential occupancies, as specified by NFPA 101: Life Safety Code. This edition also requires floor fire protection for new non-sprinklered one- and two-family dwellings. In another important change benefitting fire and life safety, the Code specifies that two-way radio communication enhancement systems may be required by the Authority Having Jurisdiction (AHJ) per provisions in NFPA 72. The 2009 edition of NFPA 1: Fire Code introduces the Code's new title and increases the amount of practical guidance available to users. Instead of listing references, this edition of the renamed NFPA 1: Fire Code provides extracted text addressing interior finish, contents and furnishings, and dust control requirements for industrial hazards. Fire flow requirements have been moved from the Annex to the body of the Code to ensure consistency among jurisdictions. New requirements address motion picture and television production work done on location, away from the main studio soundstages. Three new Annexes provide information and guidelines for fire fighters and other emergency responders, to help improve community and fire fighter safety. The 2006 edition of NFPA 1: Uniform Fire Code™ adds critical information through new chapters. New Chapter 6: Classification of Occupancy defines occupancy classifications to enhance your understanding of requirements and improve compliance and enforcement. New Chapter 32: Motion Picture and Television Production Studio Soundstage and Production Facilities works in conjunction with NFPA 140 to provide a minimum level of fire and life safety on the sets of these activities. New Chapter 33: Outside Storage of Tires includes provisions to keep tire storage safe from all potential sources of ignition. New Chapter 34: General Storage presents provisions that apply to indoor and outdoor storage of materials representing the broad range of combustibles. The 2003 edition of NFPA 1: Uniform Fire Code integrates the two most widely adopted fire codes in the United States into a single Code. A joint venture between NFPA and the Western Fire Chiefs Association, NFPA 1: Uniform Fire Code incorporates provisions from both the Fire Prevention Code and the WFCA's Uniform Fire Code, to create a document that serves communities and jurisdictions nationwide. NFPA 1: UFC is fully compatible with regulatory adoption procedures, with separate sections containing provisions for administration and code enforcement, occupancies, processes, equipment, and hazardous materials. Essential extracts and references to more than 130 NFPA codes and standards make the code official's job easier. 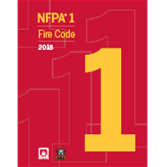 Interested in other editions of NFPA 1: Fire Code? Use the drop down menu above to select the edition year you need.